NOTICE: Activation key must be used on a valid Steam account, requires internet connection. ABOUT THE GAME The world has been shattered, and you have been exiled to one of its many shards. The time has come to return to Ardania and seek vengeance on those who cast you out. 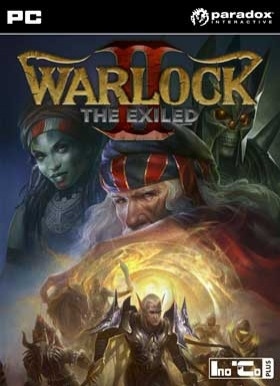 Battle through the fractured realms inhabited by other exiles, hostile Mages and terrifying creatures. Once back in Ardani… a you will face your greatest threat: The Four Vicars of the United One. Conquer all who oppose you, reclaim your home and take your revenge. Warlock 2 is a turn-based strategy game of fantasy warfare. Rival against Great Mages, lead mighty armies into fierce battles, wield ancient magic, use cunning diplomacy and faith as your weapons. Experience the challenge in single or multiplayer. KEY FEATURESA fantasy wargame like no other – A diplomatic victory is not an option, you cannotrelax until your enemies lie crushed under the might of your strategic brilliance!The turn-based hex maps gives you time to ponder your next move and your weaponsare the vast armies that relentlessly march to conquer all that oppose you. You are the Great mage – Select who you are from a roster of over a dozenGreat Mages, all with different abilities and spells, and choose which people youcommand on your path to victory. If no Great Mage suits your taste you can evencustom build your own from scratch. Proudly wield your magical power – Not only a superb battlefield commander, yourimmense magical powers will also aid you in your conquest. Carefully research over170 spells and choose what to specialize in, from direct attack spells to terraforming,or maybe align yourself to one of the Gods to harness their powerful blessings.With time, you are even capable of customizing each spell using powerful glyphs. Diverse worlds requires different approaches – The several different and randomlygenerated maps all have their unique challenges and opposition to defeat. Use theterrain to your advantage! Different campaigns – Choose from either engaging your foes on a grand map inthe sandbox game mode or the path of the Exiled, a revenge tale full of twists andturns, where you strike back at those who banished you from the world of Ardania. Raise armies – The people you lead and conquer all bring their unique units toyour command. Choose if you want to field a stalwart Human army, command theUndead hordes, use the mysterious Planeswalkers, or mix and match them all plusothers to your delight. There are a total of six different races to pick from, eachwith their own strengths and weaknesses. Hire heroes – When your reputation grows, random heroes will be attracted toyour cause, bringing with them their own special flavor to add to battles. Equipthem with legendary artifacts, found or crafted, and make them your battlefieldcommanders. SYSTEM REQUIREMENTS Minimum: OS: Windows Vista 64-bit, Windows 7 64-bit Processor: Dual Core CPU with 2,66GHz clock speed or higher Memory: 4 GB RAM Graphics: nVidia GeForce 8600 GT or ATI Radeon HD 6570 DirectX: Version 9.0c Hard Drive: 2 GB available space Sound Card: DirectX 9.0c compatible Recommended: OS: Windows Vista 64-bit, Windows 7 64-bit or Windows 8 64-bit Processor: Intel I3-3240 @ 3.4 GHz or AMD Phenom II X4 955 @ 3.2 GHz Memory: 4 GB RAM Graphics: nVidia GeForce 550 Ti or ATI Radeon HD 6850 Hard Drive: 2 GB available space Sound Card: DirectX 9.0c compatible	© 2014 Paradox Interactive™. Trademarks belong to their respective owners. All rights reserved.